Blog updated at 6:10 AM MDT Fri April 27, 2012. 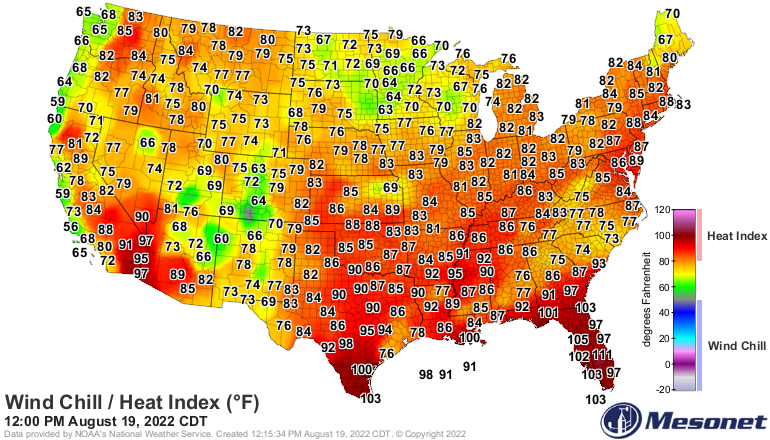 Daily Record Highs Set Wednesday. 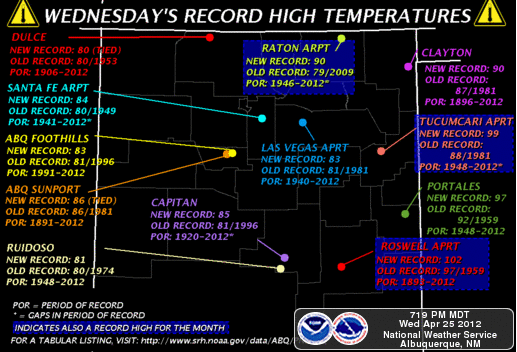 Monthly Record Highs Set Wednesday. 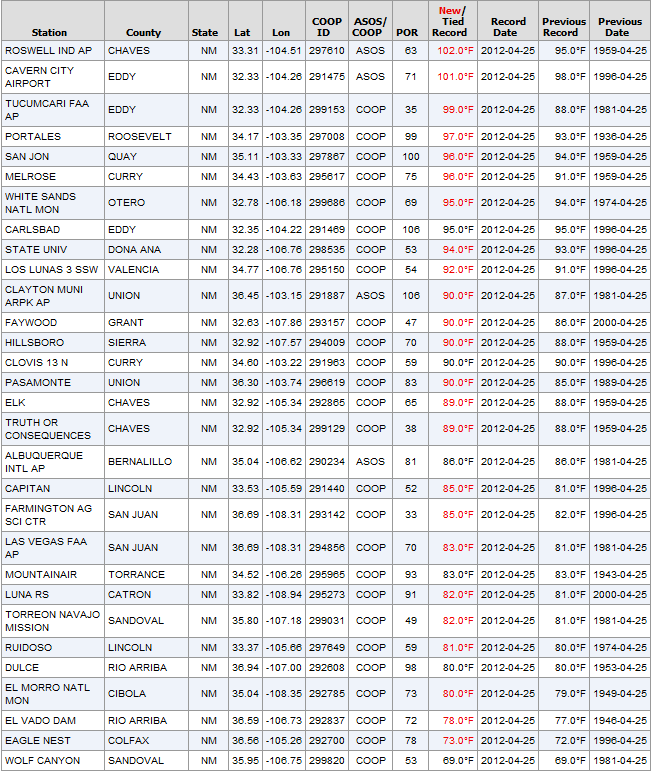 Temperature Records Are Courtesy Of The NCDC. Blistering heat for late April established new record high temperatures across the area yesterday afternoon. 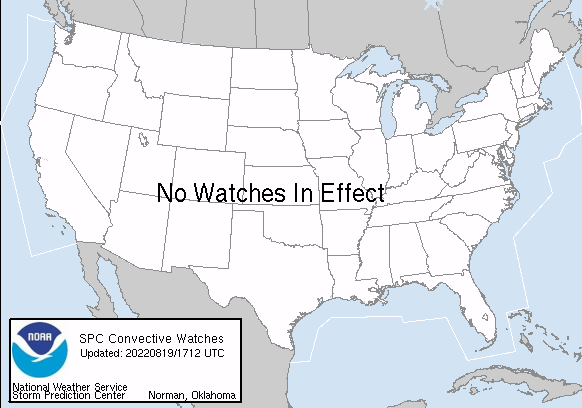 I really hope that yesterday's heat is not a precursor of what the rest of our spring and summer has to offer. 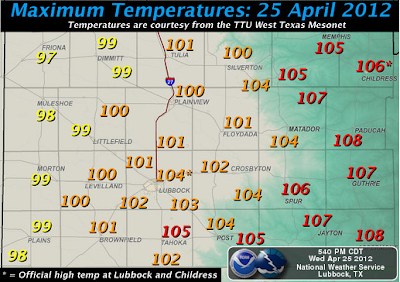 Lubbock, Texas topped out at 104, which breaks the previous record high of 100 for the month of April set on April 16, 1925, and April 22, 1989. Midland, Texas topped out at 104, which breaks the previous record high of 101 for the month of April set on April 21, 1989, and April 27, 1996. 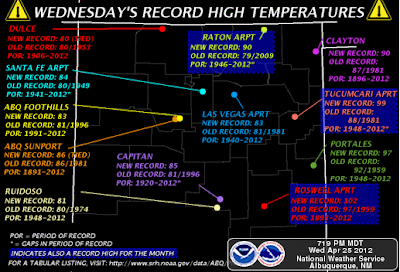 The Roswell, New Mexico Airport topped out at 102, which breaks the previous record high of 101 for the month of April set on April 22, 1965. The Carlsbad, New Mexico Airport topped out at 101, which ties the previous record high of 101 for the month of April last set on April 21, 1965. The Carlsbad Climate Co-Op Station topped out at 101, which beats the previous record high of 100 for the month of April set on April 18, 1909, April 16, 1925, April 22, 1934, and April 24, 1943. The Carlsbad Caverns Climate Co-Op Station topped out at 96, which beats the previous record high of 95 for the month of April last set on April 22, 1989, April 23, 1989, and April 30, 2002. 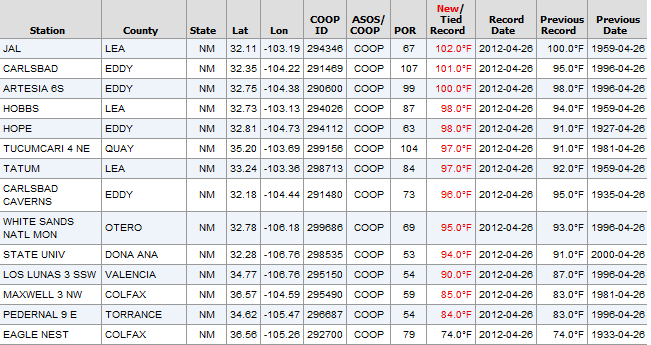 The Hobbs, New Mexico Climate Co-Op Station topped out at 101, which beats the previous record high of 98 for the month of April set on April 18, 1987, and April 21, 1989. The Tatum Climate Co-Op Station topped out at 97, which ties the previous record high of 97 for the month of April last set on April 22, 1965, April 23, 1989, and April 28, 1996. The Jal Climate Co-Op Station topped out at 102, which ties the previous record high of 102 for the month of April last set on April 21, 1965. 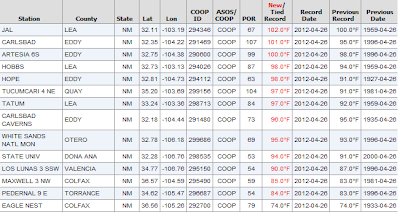 Note- The Artesia Climate Co-Op Station topped out at 100, which beats the previous record high temp for the date (April 25th) of 98 last set on April 28, 1996, and April 23, 1965. 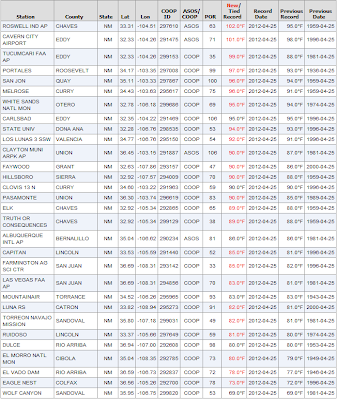 However, the all-time April high of 104 set on April 10, 1934 still stands unchallenged. 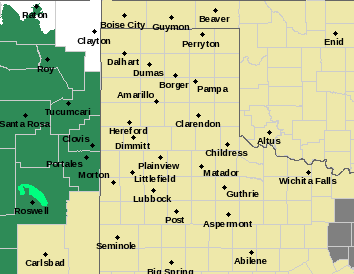 High Wind Warnings are in effect for today for parts of southern New Mexico where southwesterly winds are forecast to gust up to around 55 mph. Wind Advisories are in effect for the southern Sacramento Mountains for today, including the Cloudcroft and Mayhill areas. 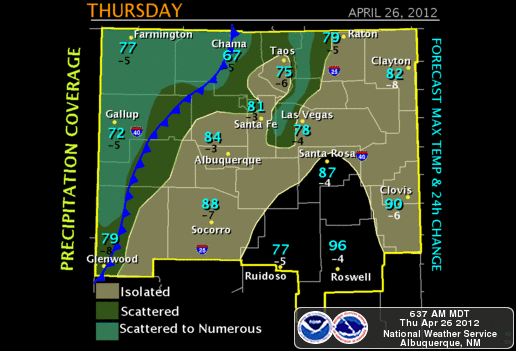 Southwesterly winds are forecast to gust up to 55 mph. 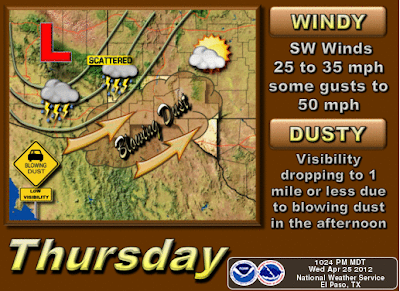 A Blowing Dust Advisory is also in effect for parts of southern New Mexico today and this evening. 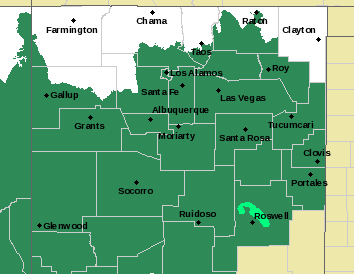 High Wind Warnings are also in effect for much of the rest of New Mexico today into this evening, including the Ruidoso area in Lincoln County. 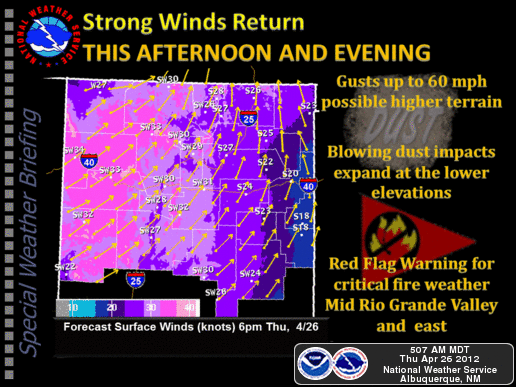 Southwesterly winds are forecast to gust up to around 55-60 mph. 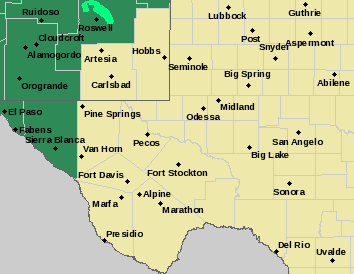 A High Wind Watch continues in effect for this evening for the Guadalupe Mountains. Southwesterly winds are forecast to gust up to around 60 mph. 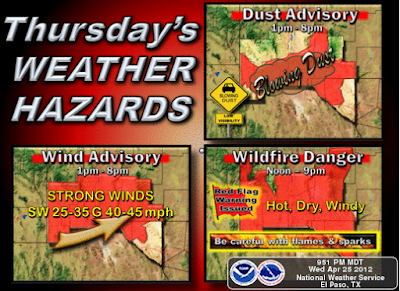 Red Flag Warnings cover the area today for Critically Dangerous Fire Weather Conditions. Please avoid any type of outdoor activity that involves the use of sparks or flame today. 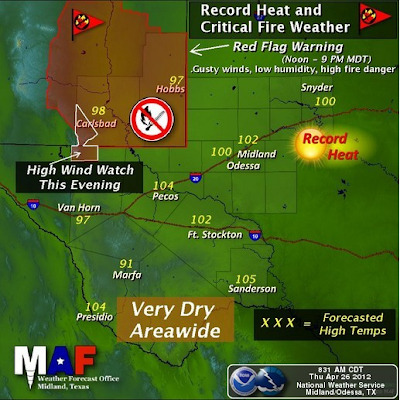 Any fire that may be accidentally started will have the ability to rapidly spread and grow in the strong wind gusts and extremely dry conditions. The Pretty Bird Fire located 16 miles northeast of Pinon in the southern Sacramento Mountains continues to burn out of control as of yesterday's briefing. It had consumed 126 acres and was 0% contained. It is burning in very rough terrain. Another hot day is in store for us today. 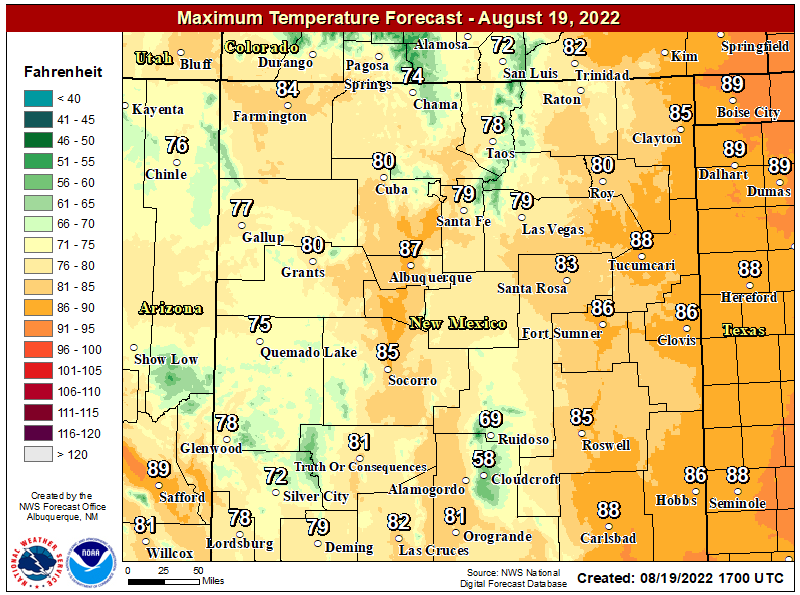 Our afternoon high temperatures should climb up into the mid-upper 90's, and with these readings a few daily record high temperatures may be jeopardy of falling. A thick deck of mid-high level clouds will damper our highs just a tad and should keep today's readings down a few degrees below yesterday's. 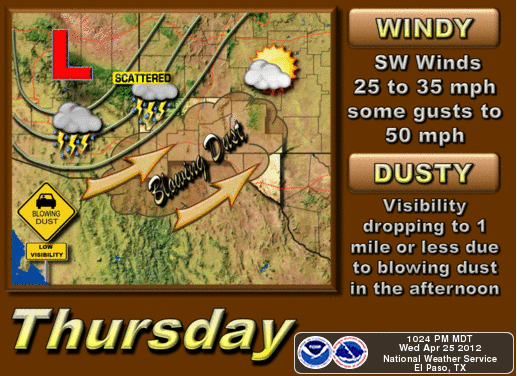 Southwesterly winds will kick up later today at around 15-25 mph with some locations seeing gusts of around 35-40 mph. 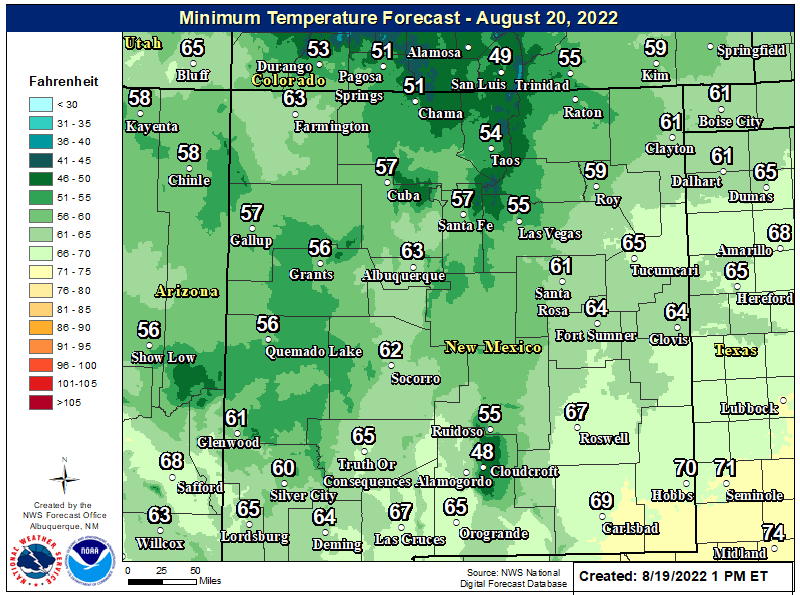 A cold front is still forecast to enter the area Friday night, which will spread cooler weather across the area into the weekend. 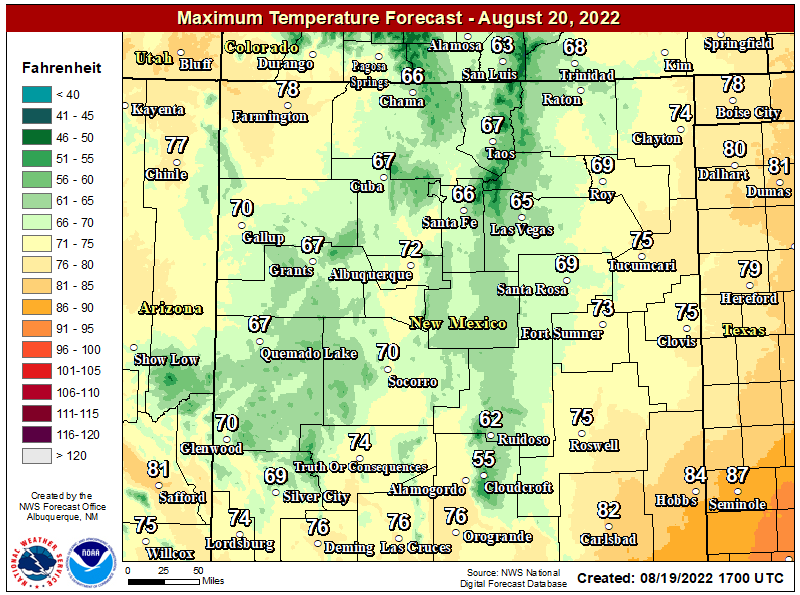 Most of southeastern New Mexico will see highs in the 80's. A trough of low pressure in the mid-upper levels of the atmosphere to our west this weekend, will eject disturbances northeastward across the state into the first of next week. 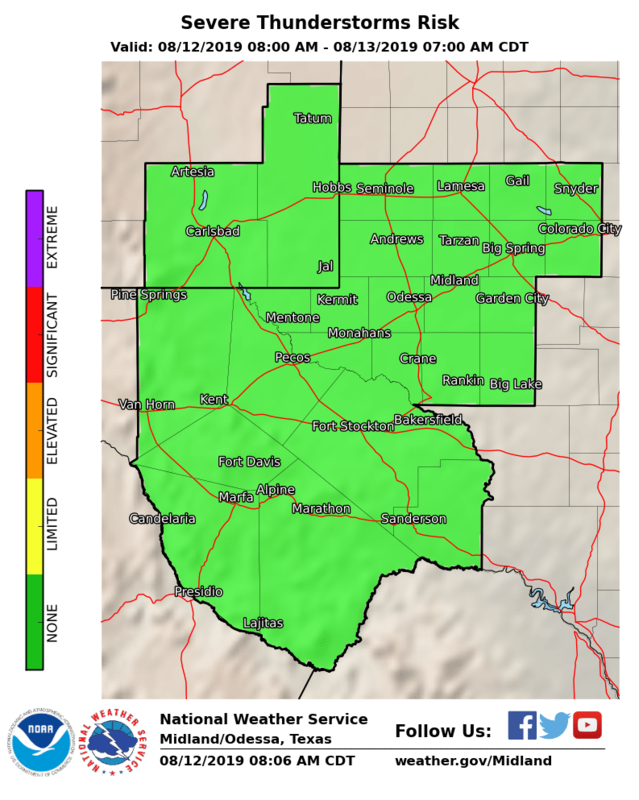 These disturbances combined with an increase in low-level moisture should produce a few scattered t-storms across SE NM Saturday into the first of next week. 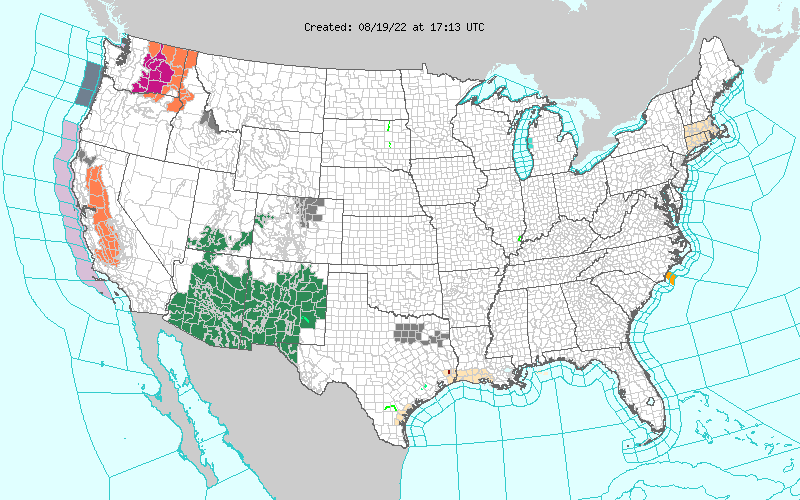 Right now it appears that these t-storms will be the mostly hit and miss types, and many of us may not get much rainfall out of them.